On a beautiful bright crisp winter morning at the picturesque Dinton Pastures, Reading it was great to have a few hours of happiness in what has been a very tough sad personal week for me and my mum! One thing I love about parkrun is so many positive things can happen at 9am every Saturday morning and Reading kept giving and giving with celebrating parkrun milestones, meeting tourist friends, an inspirational volunteer and a exceptional running fundraiser, wow! First of all two inspirational members of Reading parkrun community, first up is Ray Jones who has reached the hallowed milestone of completing 250 events, who was very welcoming to us all and my I say that your celebration cakes were delicious, a running achievement to be proud of sir! Next up is Chris Smith with over 250 volunteers to his name is a hi vis hero for Reading parkrun who Marshall’s the vital position on this winter course, directing runners in which route to take around the lake depending on what lap they are on! Chris the outstanding commitment you have shown to your community should be applauded by everyone who loves parkrun! One thing is always a delight is meeting old and making new parkrun friends at different locations, so today I welcomed back Martin Ball, Kevin Brown, Terry Garner and met for the first time the lovely Luscombe family that consists of Adrian, Sarah and Daisy, great to meet you guy’s! For the record this selfless runner is fundraising for different very worthy causes for his local community by continually running daily 5k with today at Reading he was on day 413 of his adventure! I feel that I have met a kindred spirit in Matthew as in 2016-17 I completed a year of fundraising for my local hospice through my capital parkrun adventures! Matthew I salute you for all the hard work you put in for your worthy causes, outstanding body of work mate! This was their winter course that takes place at Dinton Pastures that consists of 3 anti-clockwise laps that incorporates both Black and White Swan lakes. The first two shorter laps are run around the strip of land that buffers both lakes, but the final longer lap is run around the entire parameter of White Swan lake! This is a very flat course as you would expect running around lakes and the surface is a mixture of compact earth/gravel paths! The surface overall still only warranted normal trainers as trail shoes would have been overkill! My time today was 35:48 that under the circumstances of not running this week I was happy with this level of fitness! There is paid parking available at Dinton Pastures Sat Nav location RG10 0TH, toilets are available from 8.30am at the Dragonfly cafe and you can buy your parking from the cafe as well! I would like to thank today’s run director Peter Reilly and his team of volunteers for making us all feel extremely welcome and part of your community! So finally with a great flat 3 lap winter course around the lakes of Dinton Pastures is a must destination for any parkrun tourist, you have been told! In the depths of winter my love affair with Essex and East London parkruns grows even stronger as on this bitterly cold day the depth of welcome I received from Billericay community was heartwarmingly welcoming! 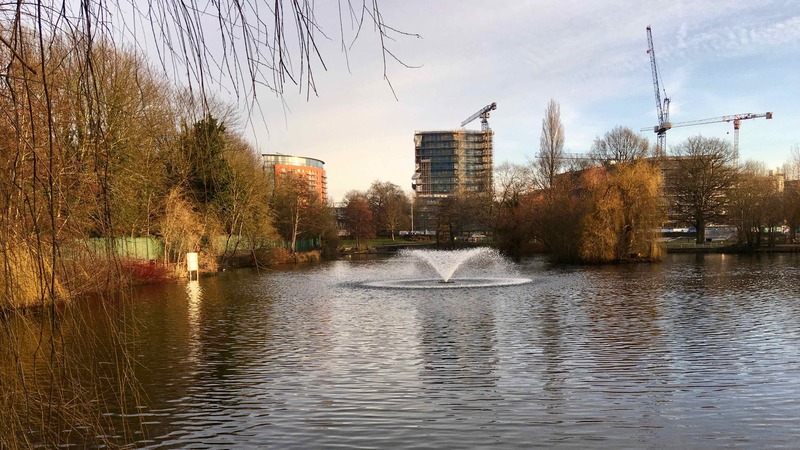 This park covers 40 acres and was originally owned by the Spitty family, who had the lake dug out by unemployed labourers, but the local council had the foresight in 1935 to buy this land and transform it into the lovely park you see today, well done! This parkrun journey of discovery never ceases to amaze me with Billericay parkrun just 7 months old but has the core nucleus of a great community feel is there for any tourist to see soon as you walk through the park gates! So how do measure this could it be the friendly chat with the local patrons before the start of the run, young Sofie’s corner where she welcomely cheers you up the hill or chatting away with Judith Campbell as we come towards the finish, even the very friendly post run coffee chat (thank you to the kind couple was bought me a unexpected coffee) was a lovely finishing touch to this morning event! So in summary Billericay has all of these qualities in spades and it is great to see the local town wholeheartedly get behind their event! It’s great to see how the Friend of Lake Meadows come up with this excellent project to turn the sad loss of one of the parks oak trees, then get the necessary funding and with the aid of a talented sculptor in Neil Bruce come up with this excellent depiction of The Wizard and the Dragon that is a striking visual talking point when you enter the park, brilliant stuff! This winter course was a modified 3.8 anticlockwise laps of Lake Meadows that was a mixture of tarmac paths and grass, undulating in nature that tested your stamina, but the inclines were far from being to excessive! On the final lap you turn off towards the finish just after the edge of the lake! As with most courses this time of year ice is a continual worry for event organisers with this event not being immune with two short tarmac sections being iced over with standing water so effecting this weeks route that took couple of diversions onto the grass! My time was 34.21 that is a little bit misleading as with the changes to the route I just run just under 5k distance but is very understandable under the circumstances and 1000% more preferable than cancelling this event! There is free weekend parking available at Radford Crescent council car park Sat Nav CM12 0DR, For some reason the parks toilets were closed before the event but I have been told by the core team that is is not a usual occurrence! For the obligatory post run coffee we retired to Cafe in the Park that was very welcoming in that very inclement weather! Cricket pitch and skate park. I would like to give a resounding thank you to the run director Samuel Hill and his team of volunteers that done a excellent job in dealing with very tricky course conditions in a very happy positive way! Finally so Billericay you may be new in parkrun events terms, but have a brilliant exuberance and kind supportive manor about your event that if I did not know any better I had always been a member of your community, top marks Billericay! On a very cold wet winters day it was all about a significant personal milestone and a fond farewell for one local park runner at Woodley, Berkshire! So Woodley is the largest suburb of Reading and it’s name is derived from old English term meaning “a clearing in the woods” with today’s parkrun situated at Woodford park that is the largest park in Woodley! It is great to see how many different elements of Woodford park just worked from a beautifully kept War Memorial for the brave soldiers who lost their lives to a lake to walk around and leisure centre including playing fields at the other side of the park. A true great use of available space for the local community, top stuff!!! I have now completed 75 different parkrun events over a period just over year and a half in taking parkrun tourism seriously, so now well on my way of reaching my 100th target at Houghton Hall parkrun on the 8th September! For the record I am aiming to join the unofficial parkrun group of Cowell club members that is named after Chris Cowell who was the first person to complete this impressive 100 parkrun total. I was lucky to meet the great man himself at Heartwood Forest parkrun and what gentlemen he was to talk with about his adventures!!!! For Simon Goodall who run with is guide Andy Loring his last parkrun at Woodley this weekend as he is moving home to Hatfield, Hertfordshire. Must feel strange as parkrun is more than a 5k run every Saturday morning it’s where you meet your friends, share stories and feel part of a wonderful community of likeminded people! Each week on my travels I get that little bit more homesick for Luton, Wardown with Pete’s corner, chatting with friends and having coffee at our lovely cricket club! Woodley consists of 3 clockwise laps of the perimeter of Woodford park that is mainly run on tarmac paths, but there are grass sections around the playing fields and the short turn onto the grass to run into the finish! There is no real elevation to this course, just minor undulations up to the war memorial and the playing fields sections respectfully! With over 400 runners at this event it did become quite congested at the start, so I would recommend place yourself in the queue where you think you are going to finish the run in relation to time! As shown the grass sections were very muddy but if you run at the sides of the path you could still find firm footing though! Not sure what happened with this weeks time 37:02 two minutes slower than last event, can only think that taking it steadily on the grass sections in the rain! I have been told that toilets are available inside the Oakwood centre from 8:30am that is always good to hear! For the post run coffee we retired to the lovely Brown Bag cafe that is situated inside the Oakwood centre for a well deserve hot beverage on this coldest of days! I would like to thank run director Samantha Whalley and her team of volunteers for making us feel welcome on a bitterly cold day! Special mention to fellow uber parkrun tourist Jenny Mulhearn, it was great meeting you and sharing our tourist stories together! So if you are looking for a interesting multi terrain 3 lapper and want to meet a friendly parkrun community then Woodley is a must on your travels! So this week I came to Chelmsford the county town of Essex to witness the phenomenon of one of the most well attended parkrun events in the UK and try to find out the secret behind it’s success! So Chelmsford with a population of 168,000 and is the only city in the county of Essex, with the honour being bestowed on the town as it was then in 2012 as part of the Queens Diamond Jubilee celebration. 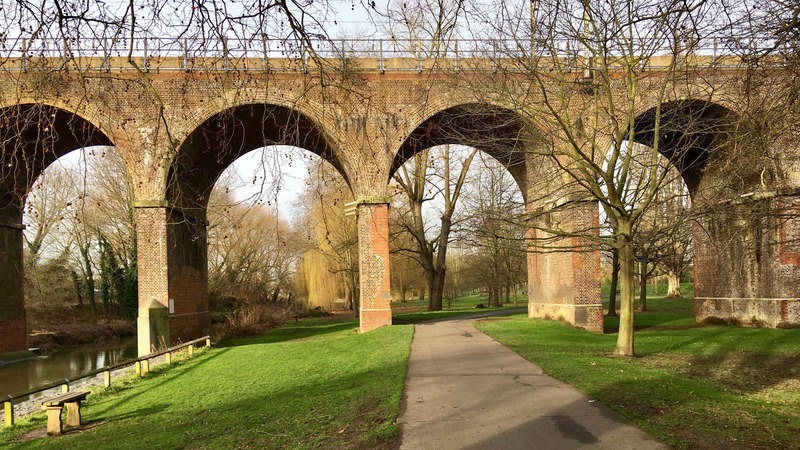 Apart from being England’s newest city there is so much to see and do on your visit from it’s heritage to sports venues, plus Chelmsford being so close to London is a great destination for a day trip! So location is always key for a successful attended parkrun with this one in the centre of the city, but there is so much more to this single lap event that normally boasts attendances of over 600 park runners every week with 697 for event 270 this week alone, wow!!! 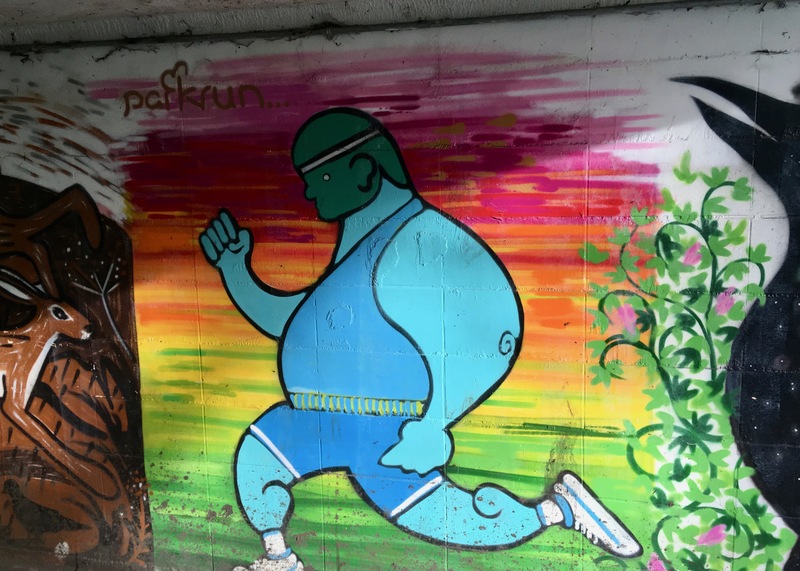 Even the urban art in the underpass connecting the parks together is a great touch to give you the feel you are running in a city! So location and a very enjoyable course has a lot going for Chelmsford and I would like to congratulate Sarah Hawkes one of this parkrun regulars on reaching the 100 parkrun this weekend, excellent work and it was all pleasure to meet you may I add! Single lap course incorporating both Chelmsford central and Admirals Parks, mainly run on tarmac footpaths but there are a few grass sections especially around Admirals park area! Not much elevation on this course except for a short sharp slope running up to Rainsford Road from the playground section! Final 30 metres are again run on grass and the advice you are given is take it steady when you come over the finish line! My time 35:51 is now the time to beat in my fight to regain my fitness and pace! There are two car parks serving this event with Waterhouse Lane on Meteor Way free at weekends, Sat Nav CM1 2RL that is slightly different postcode listed on Chelmsford parkrun website course page. For our post run coffee we retired to the lovely establishment of Cake at the Lake cafe located very close to the finish in Central park. Another welcome feature the toilets behind the cafe were available before the start of this event! I would like to thank the Run Director Paul Brookes and his team of volunteers for making us all feel welcome, a special mention goes to how very well organised this parkrun was from the start to the finish processing of the results especially in having to deal with such a large field of runners, top work guys!!! So did I find the answer to my question why Chelmsford is so well attended possibly not but with a central location, people and a top single lap course you can see some of the ingredients at work! So my parkrun tourist friends if you have not run Chelmsford Central I ask you the question, why not you have been told!!! This week at Oxford there were a couple of parkrun firsts for me from running in a new county of Oxfordshire and seeing first hand a small piece of the hard work that goes into the development of a new parkrun event! It was great to see that event no 320 that Oxford invited members of Witney core team to run this event for the day giving them vital training before the launch of their new event in the near future! I can only imagine the hard work that goes in from a local running community starting from the initial idea to the birth of a new parkrun event! Under the excellent supervision of local parkrun ambassador Dominic Guinness, the Vi-Vis hero’s from Witney done a brilliant job expertly lead by their very own run director Punam Owens, you were all naturals and run the event seamlessly! Run on the winter course that comprises of 3 anticlockwise laps of Cutteslowe and Sunnymead park that running surface is a mixture of tarmac, gravel and grass! Not much elevation on this course apart from a minor incline starting at the backend section near the lower pavilion to the finish! Near the start there is a small bottleneck at the southern corner where the grass meets a track alongside the A40 that soon clears though! Time today was 36:02 now I know where my current fitness level is on this flat 5k course! There is paid parking at this event, but interesting fact is that charges do not come into effect until after 10am, so for most park runners that makes it free to park, even if you stay for an extra hour it is only 60p. So very friendly for tourists having to come by car to this event! For easy access for the start of the parkrun the northern car park is best, but I suggest using the post code OX2 8LH for Harbord Road that leads straight onto the car park. The other post code OX2 8NP sends you into Park Close that unless you know their is a small private road off this close that double backs into the park, quite confusing for none locals! Odd thing there are large amount of toilets available at this park but for some reason were closed before the start of the parkrun, a kind member of staff did though let me use the inside toilet at Cutteslowe pavilion though! I would like to thank Oxford parkrun community for making us all feel extremely welcome on the day, top stuff guy’s! Also good luck to the volunteers from Witney, I am positive when your event goes live it will be a great addition to parkrun UK community and I promise to visit you one day! So finally if you are looking for a fast flat multi-terrain course then Oxford is definitely the parkrun for you!! Special mention to Evelyn Lutterodt who celebrated her 100th parkrun at Luton, Wardown, but this is no ordinary lady as she has run every distance from 5K to Marathon and as I am writing this is on day 410 of her running streak, wow!!! She also writes a successful blog called This Runner Loves Purple and we are very lucky to have this lady at our running club and is an inspiration to everyone who knows her, outstanding achievements Evelyn!!!! On a bitterly cold January morning the warmth of the Great Notley parkrun community was outstanding that I have only witnessed a few times on my tourist travels! 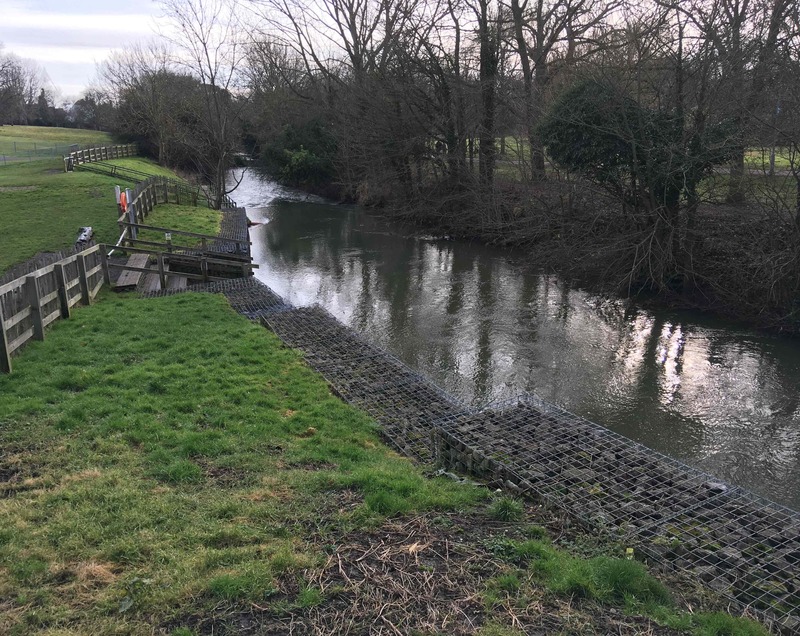 It is great to run in an environment where you feel you instantly belong even though I was 70 miles away from my beloved home parkrun of Luton, Wardown, wow! With a population of 5,500 Great Notley was developed as a self-sustaining garden village back in 1993 by Countryside Developments and part of this village was the building of a new Country Park the home of today’s parkrun! One tradition for tourists to Great Notley is to sign their guest book that is a great way of you showing your appreciation of the event and it’s volunteers, so if you have the time add a message of thanks! Today we run the winter course that is two anticlockwise laps of Great Notley Country Park, which is run mainly on gravel paths but has a few grass sections and very unusually a children’s sand play area to run through, I kid you not!!! Great feature on this course is at the end of lap 1 only you run up the park’s man-made hill to the bird of freedom sculpture and probably for good luck the locals invite you to touch the birds plinth when you get to the top! Like a lot of courses this time of year you had to be weary of the mud and ice especially running down their grass hill section! My time was 39:13 not great but under the circumstances not feeling well the previous evening I cannot complain! There is a pay and display car park at this event Sat Nav CM77 7FS with up on 2 hours costing £3. There are also available both toilet and changing facilities before and after the parkrun at the parks Discovery Centre building, always welcome for us tourists traveling a distance to a parkrun! I would like to thank the run director John Stoneman and his team of volunteers for making everybody feel extremely welcome and for the record John you would make a great after dinner speaker! So would I recommend Great Notley to you all, most definitely with a top parkrun course with a hill test and a real lovely parkrun community, they are a credit to parkrun UK! Finally don’t forget to touch that bird, you have been told!!!!!! !